The proposal involved the clearing of all the land required for the residential development, roads and APZ. After the clearing had been undertaken the main bushfire threat would have then been the forest in the three connecting drainage lines/riparian corridors which dissect the subject property. The drainage lines/riparian corridors containing the bushfire threat are characterized by steep sides which include slopes of 10 to 15 degrees. However in some sections the bank drops to 18 degrees or more. This steepness cannot be managed as an APZ and this constraint has been considered in the lot layout development. This assessment specified specific building setbacks on some of the proposed lots. Habitable buildings will not be permitted within the area nominated as having a building setback. However the remainder of the site can support habitable buildings. The building setbacks were required as a condition of development consent. The consent authority is required to ensure that a mechanism is established to ensure the setback is enforced. 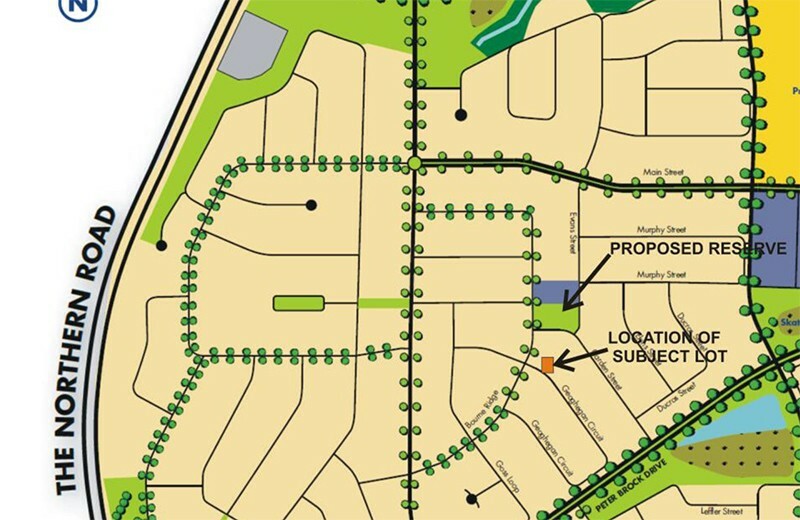 The APZ’s located outside the residential lots was composed of a two-way public road, road side reserve and stormwater treatment swales and drainage. It was proposed that a perimeter road or a fire trail to provide a buffer from the bushfire hazard was established. Also the proposed access needed to supply a perimeter road with two way access deliniating the extent of the intended development.